Why Make Trellises with Plastic Trellis Netting Instead of Twine? Trellising plants with HORTOMALLAS plastic trellis netting makes it possible to improve plant health conditions for the crop thanks to excellent air flow through the leaves. This reduces the incidence of diseases caused by excessive moisture. At the same time, it allows the plant to grow while orienting its leaves for good exposure to the sun, thus maximizing photosynthesis and fruiting results in bigger and better fruits. 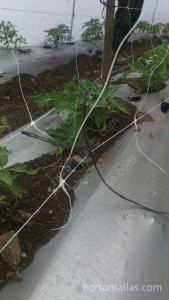 Also, just as in the case of trellising for flowers, the HORTOMALLAS plastic trellis netting is an excellent guide so that the flower stems will grow straight up. The HORTOMALLAS plastic trellis netting gets used in a double panel configuration for tomatoes. This way, by reducing human intervention, the risk of transmitting pathogens is also reduced. 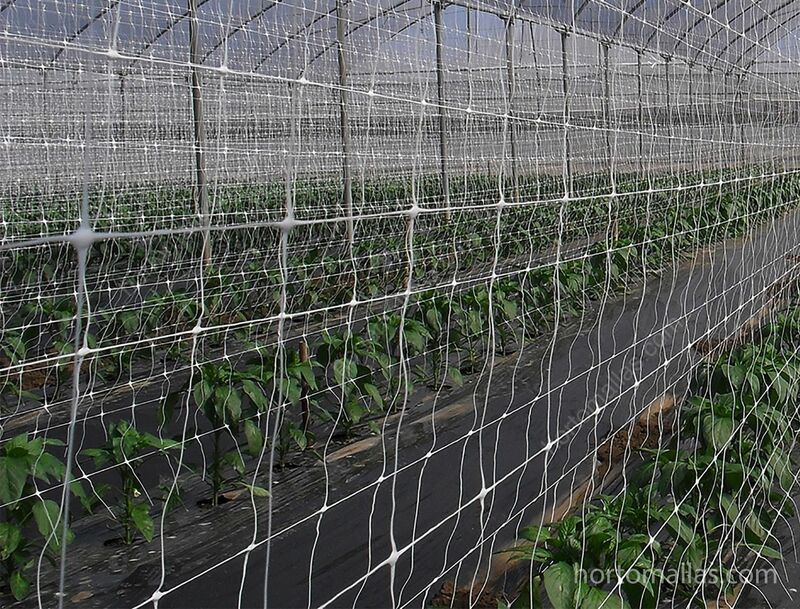 This netting as a vertical support for vegetable crops ensures that branches keep on growing upwards. This is one of the important considerations when thinking about investing in a vegetable crop since a good trellising system eliminates spotting blemishes caused by fruit contacting the ground. 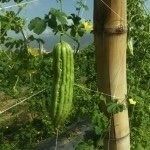 It also reduces the diseases transmitted by workers’ hands making physical contact with the plants and reduces the mechanical stress that the plant suffers when manipulated by hand to train it to trellising made with raffia twine. 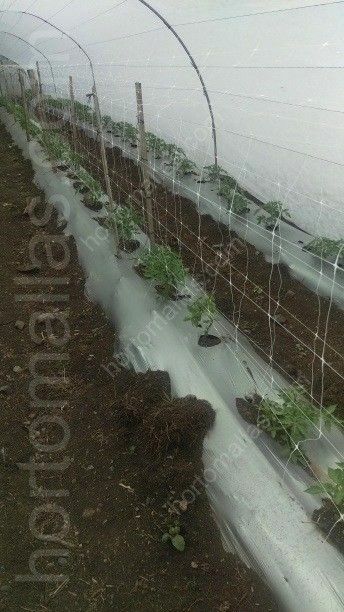 HORTOMALLAS plastic trellis netting is available in wide widths for use in greenhouses. 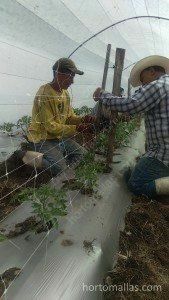 HORTOMALLAS plastic trellis netting increases the productivity and profitability of your crop while decreasing the amount of labor required. Only two people are needed to put up one hectare (2.5 A) of the HORTOMALLAS netting in a day in comparison to the 6 that are necessary when making trellising with raffia twine. 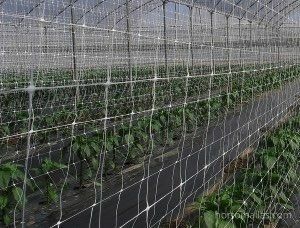 HORTOMALLAS, the netting for the support of trellis vegetables, installed in a high tunnel, INVERNAVELO, for its greenhouse effect, helps to keep the plants upright. The advantages of HORTOMALLAS do not end with labor savings. The same reduction of the number of people needed to train the plants to a trellis means that the incidence of spreading plant pathogens by making physical contact with the plant is also reduced. The netting allows the plant to come to rest on and to support itself on the squares of the HORTOMALLAS plastic trellis netting in an organic and natural manner, without the need of the daily chore of twisting raffia twine around the end of the stems and training the plant to the twine as is done with the traditional method of trellising. This netting can be reused for several crop cycles, unlike the natural-fiber raffia twine that can be, or should be, used only once because of the sanitary measures that one wants to maintain. Trellising with HORTOMALLAS rather than with raffia twine brings plant health and economical advantages with it. study Search here for the latest export prices of vegetables to the United States.